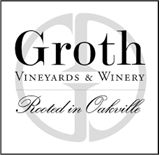 Groth Vineyards and Winery Sauvignon Blanc.Winemaker Notes: Our Sauvignon Blanc displays the ultimate characters defined by this variety: vibrant melon fruitiness balanced by a clean, crisp finish. Notes of sweet wood add a rich smoothness to the wine. Menu Suggestions: The clean, crisp flavors of Groth Sauvignon Blanc can be enjoyed with many different foods. The classic combination of oysters and Sauvignon Blanc plays up the citrus quality of the wine. The smoky flavors of grilled fish or poultry emphasize the melon flavor of the Sauvignon Blanc. These flavors are especially good when the fish or poultry is served with any tomato or fruit salsa. The crisp flavors allow Groth Sauvignon Blanc to be paired with ethnic foods that have hot, spicy flavors of garlic, herbs, and peppers. Many Thai and Indian restaurants serve Groth Sauvignon Blanc. It acts as a palate cleanser for these strong flavors. Vegetarian meals also benefit from the flavors of our Sauvignon Blanc. Groth Vineyards and Winery Sauvignon Blanc.